'Integrated Farm Management' (IFM) describes a practical, whole-farm-business approach to improving the economic, environmental and social performance of farms. IFM optimises the use of all resources on the farm including soil, water, air, staff, machinery, capital, wildlife habitats, landscape and archaeological features. Its successful uptake requires the understanding of beneficial husbandry principles and traditional methods of farming, while addressing regulation and embracing innovation. It also includes a risk management approach that anticipates, assesses, manages and develops contingency plans for any unplanned and/or natural events. Appropriate and efficient use of inputs, smarter approaches to business planning, and the adoption of innovations and new technologies, increase productivity whilst protecting valuable resources. SIP Project 1 focused on IFM. We took an IFM approach by which farmers can implement management practices to improve performance sustainably within the opportunities presented by their sectors and location. LEAF (Linking Environment And Farming) is the leading organisation promoting sustainable agriculture, food and farming in the UK. 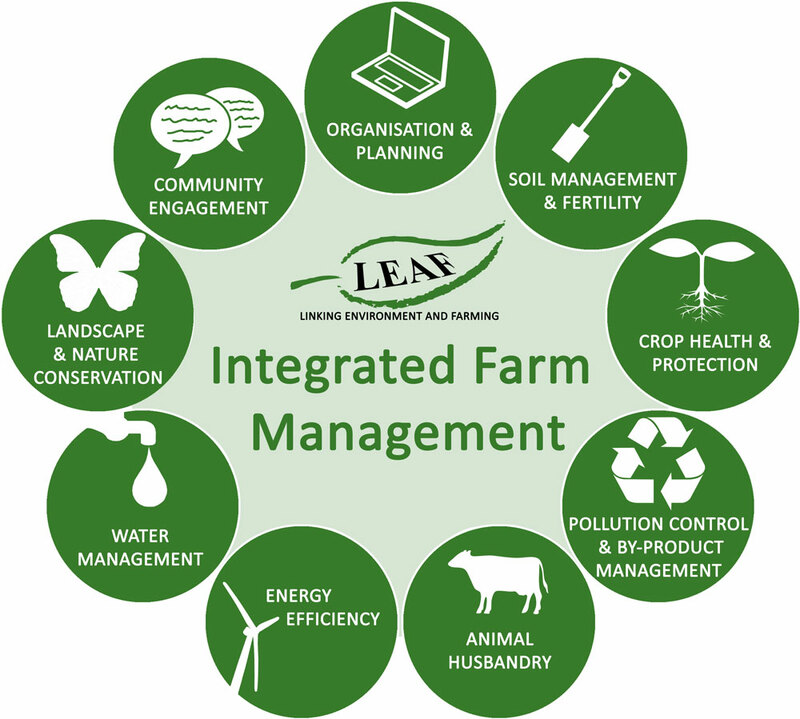 LEAF's IFM framework is made up of nine sections, shown below, which address the entire farm business at a site specific level. Each section is important. Integrated together, they are essential for effective implementation of IFM principles. A Science, Policy and Practice note outlining research on farmer and adviser attitudes to IFM and highlights the work done as part of the SIP to increase awareness and understanding.